As readers grow increasingly accustomed to vacillating continuities, DC’s Earth One universe offers some consistency. Launched in 2010 with Superman: Earth One attempted to contemporize and streamline the Man of Steel’s origin; to parallel the original mandate of Marvel’s Ultimate universe in a graphic novel format. Two successive Superman volumes followed; the Teen Titans, too. By far the most successful, in terms of both revolutionizing its central character and pure entertainment value, was Batman: Earth One. And its second volume maintains that momentum. Bruce Wayne is less than a year into his vigilante career. After the events of Volume 1, Batman has becoming a menacing presence to those who stalk Gotham’s streets; but his reputation is still solidifying, just as his skill set is still in desperate need of refinement. He’s not the capable costumed crusader we are familiar with; he’s lacking much of the equipment (including the car) and he lacks the forensic expertise we take for granted. He faces a steep learning curve in Volume 2, as the Riddler makes his presence known – in this universe, a sadistic killer with deathly punchlines – and faces up against Killer Croc. Gotham is as corrupt as ever. If it’s to earn salvation, it needs its citizens to make a stand; to become tangible beacons of light. Jim Gordon, still a lowly officer in the PD, is struggling to claw his way through the bile of his department; his alcoholic and increasingly-inept partner isn’t much of an ally. Only the mayor, Jessica Dent, and her brother, D.A. Harvey, are willing to face up against the city’s oppressive forces. But when you stand up for what’s right, you inevitably paint a target on your back. It’s not exactly rocket science: when you partner two superstar creators, with a proven track record of producing fantastic work together, something special will develop. Geoff Johns and Gary Frank produced a seminal run on Superman in the mid-2000’s, and have quickly hit their stride with this graphic novel format. When blessed with more pages, some writers will pack more plot into their story; more twists, more turns, thus diluting its core. But Johns is a pro. He leaves Frank plenty of breathing room to choreograph a variety of action scenes, as well as the quieter moments. Batman: Earth One, Volume 2 is jam-packed with characters, but it never feels overstuffed. It weaves multiple storylines, but never tangles. We are not short of great Batman stories; Frank Miller’s Year One and The Dark Knight Returns; Loeb and Sale’s The Long Halloween; more recently, Snyder and Capullo’s Court of Owls. 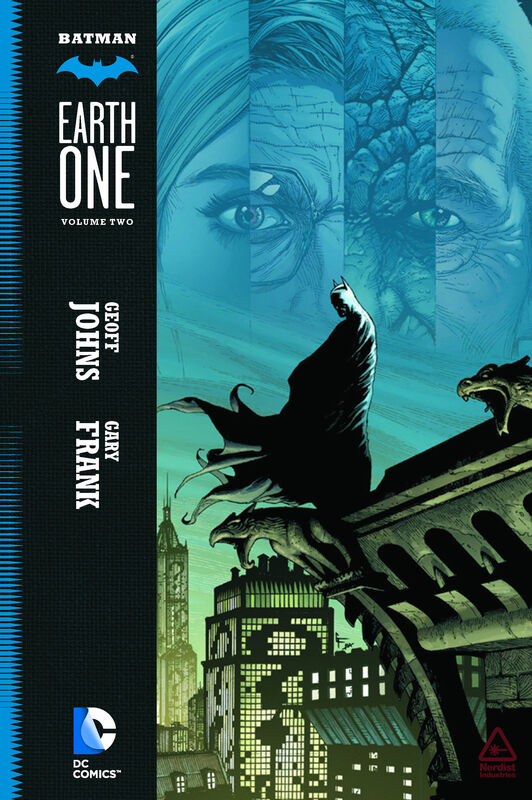 Johns and Frank’s Batman: Earth One graphic novels are among that echelon. It’ll be a long wait for the third volume.